The Team Check-up Tool. 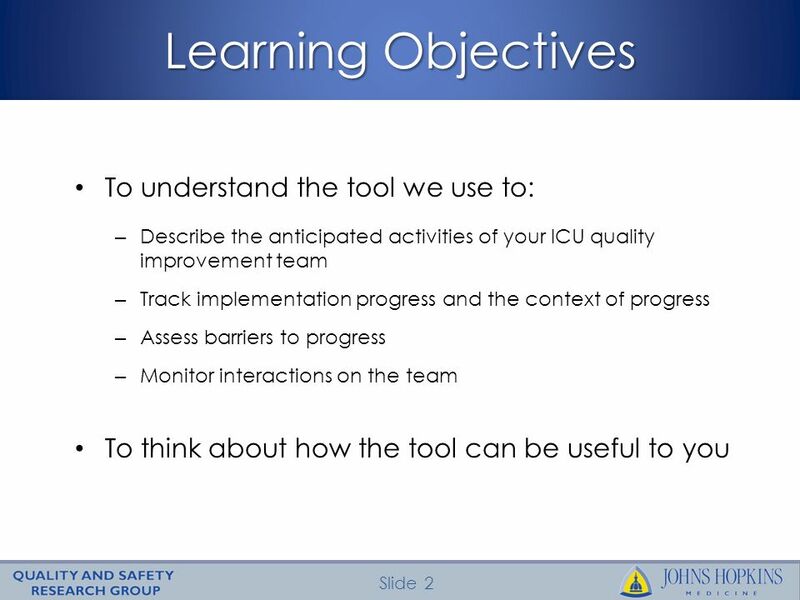 Slide 2 Learning Objectives To understand the tool we use to: – Describe the anticipated activities of your ICU quality improvement. 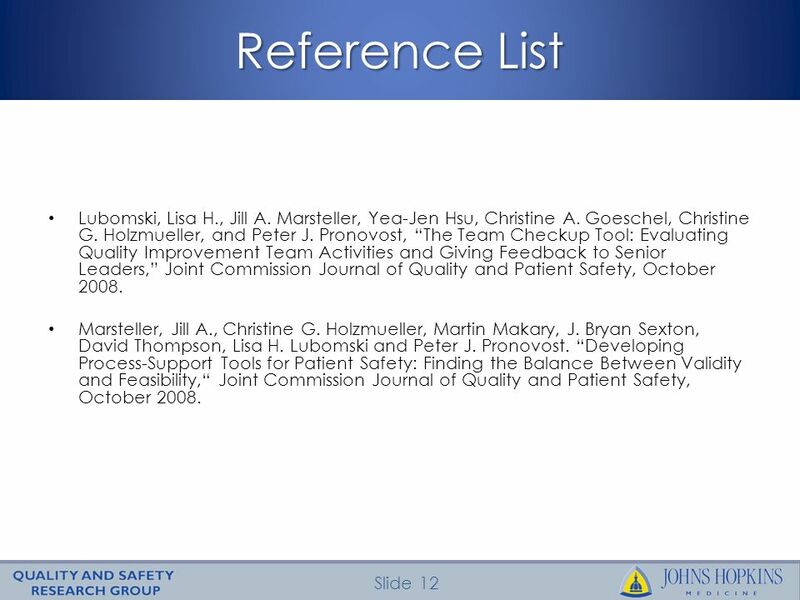 12 Slide 12 Reference List Lubomski, Lisa H., Jill A. Marsteller, Yea-Jen Hsu, Christine A. Goeschel, Christine G. Holzmueller, and Peter J. Pronovost, The Team Checkup Tool: Evaluating Quality Improvement Team Activities and Giving Feedback to Senior Leaders, Joint Commission Journal of Quality and Patient Safety, October 2008. Marsteller, Jill A., Christine G. Holzmueller, Martin Makary, J. Bryan Sexton, David Thompson, Lisa H. Lubomski and Peter J. Pronovost. Developing Process-Support Tools for Patient Safety: Finding the Balance Between Validity and Feasibility, Joint Commission Journal of Quality and Patient Safety, October 2008. 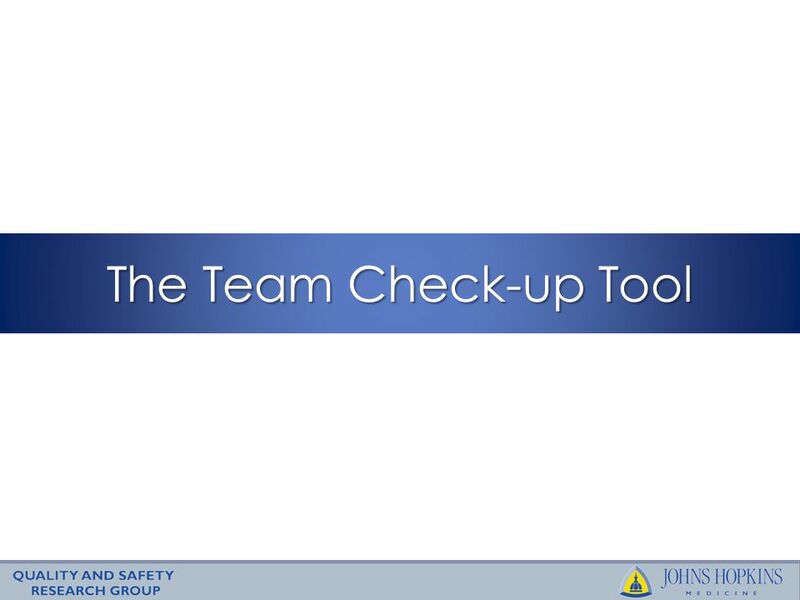 Download ppt "The Team Check-up Tool. 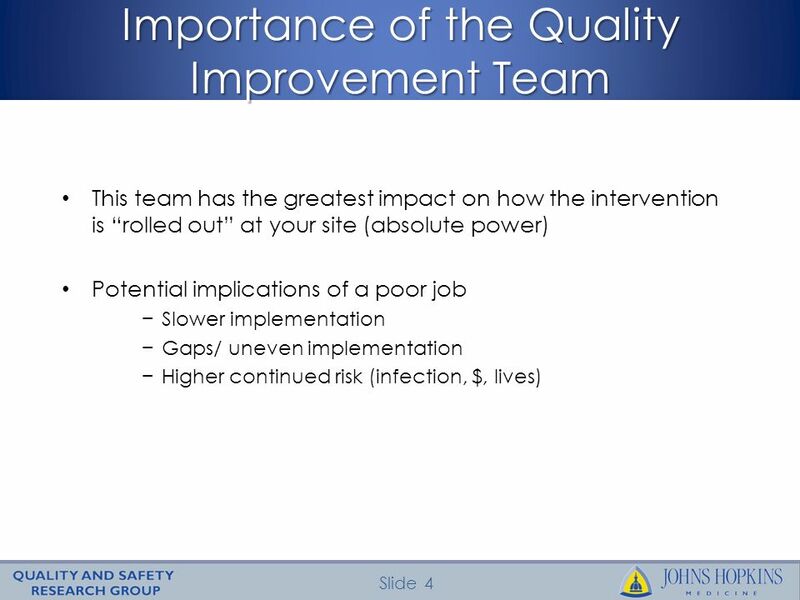 Slide 2 Learning Objectives To understand the tool we use to: – Describe the anticipated activities of your ICU quality improvement." 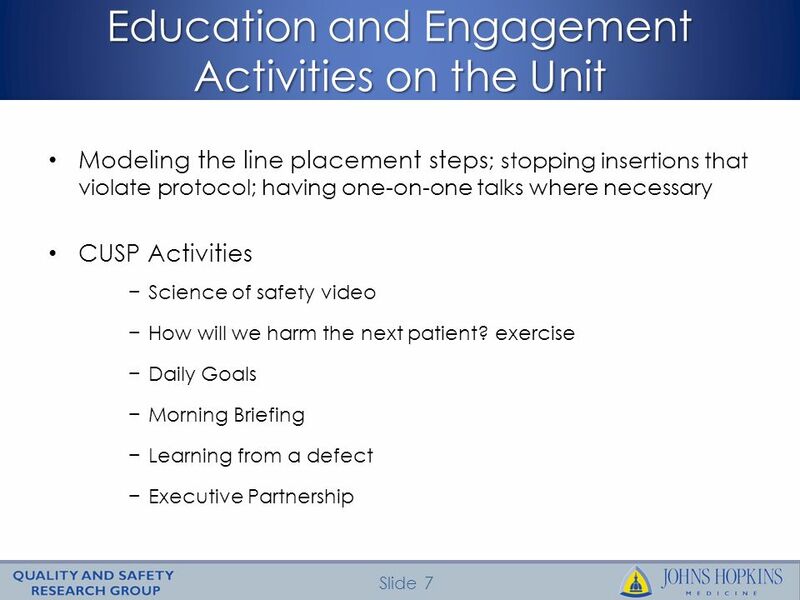 © 2009 On the CUSP: STOP BSI Christine A Goeschel RN MPA MPS ScD (candidate) Tennessee Center for Patient Safety December 2, 2009. 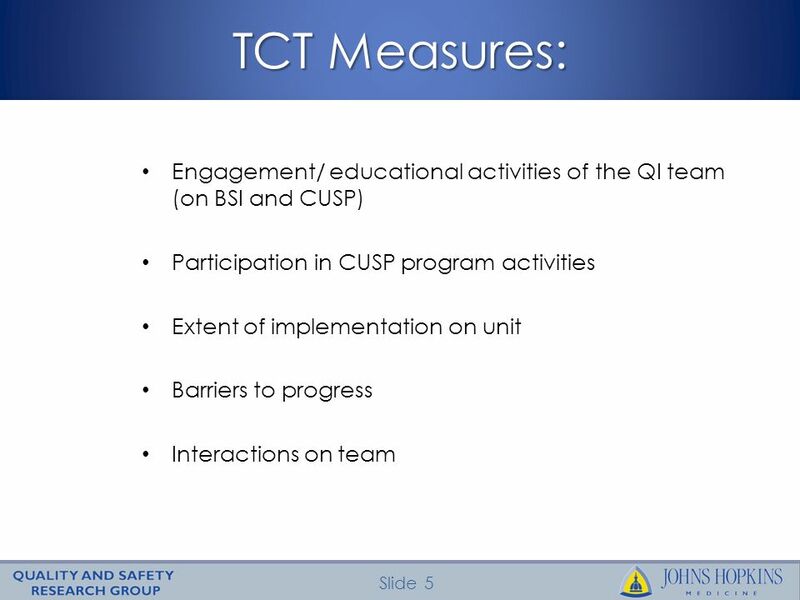 © 2009 On the CUSP: STOP BSI The Comprehensive Unit-based Safety Program (CUSP): An Intervention to Learn form Mistakes and Improve Safety Culture. 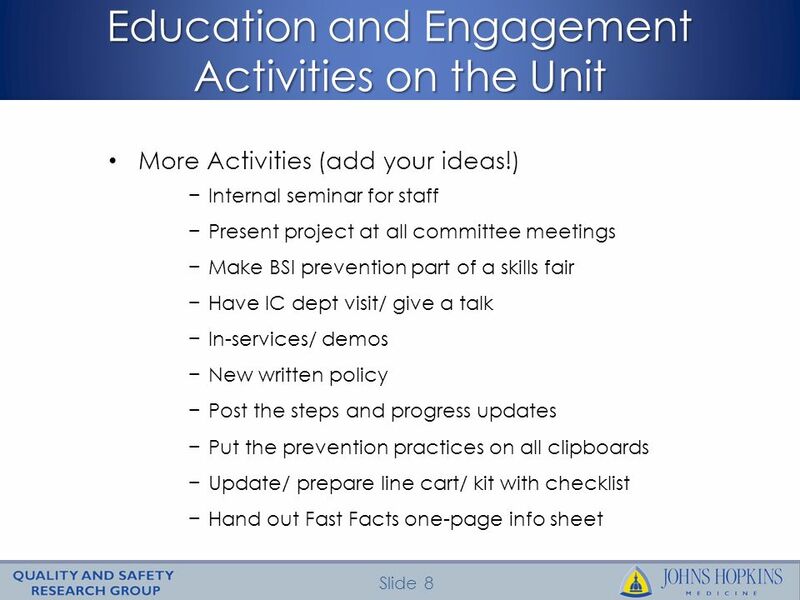 © 2009 On the CUSP: STOP BSI Physician Engagement. Code of Student Conduct (CSC) Tutorial Lesson 4 Adopting and Implementing Your CSC – The Rewards of Long-Term Investment This tutorial has been prepared. March 14, 2012 Lynne Hall.  Best Practice Committee looks at all Core Measure Data ◦ HF-1 Discharge Instructions is one of the lowest measure in Georgia. 1 Changes to the MTCT & Discussion of the Impacts on Submission Jill Marsteller PhD, MPP Christine George, RN, MS Kelly Gardner, MA On the CUSP: Stop BSI. Albany Unified School District Strategic Plan Board Study Session June 21, 2011. CLABSI Investigation Melinda Sawyer, RN, MSN, PCCN David A. Thompson DNSc, MS, RN. 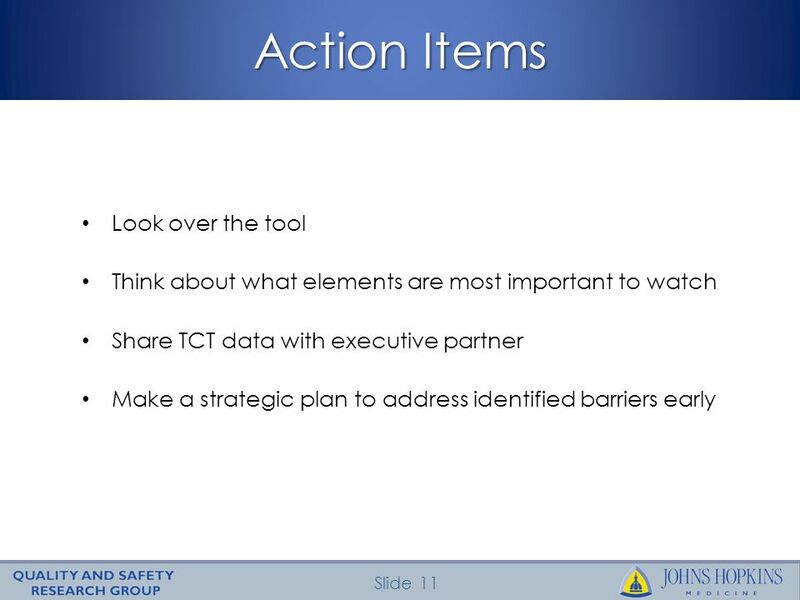 Vanderbilt Infection Control & Prevention Central Line Associated Bloodstream Infections Tennessee Center for Patient Safety Vicki Brinsko RN, CIC. 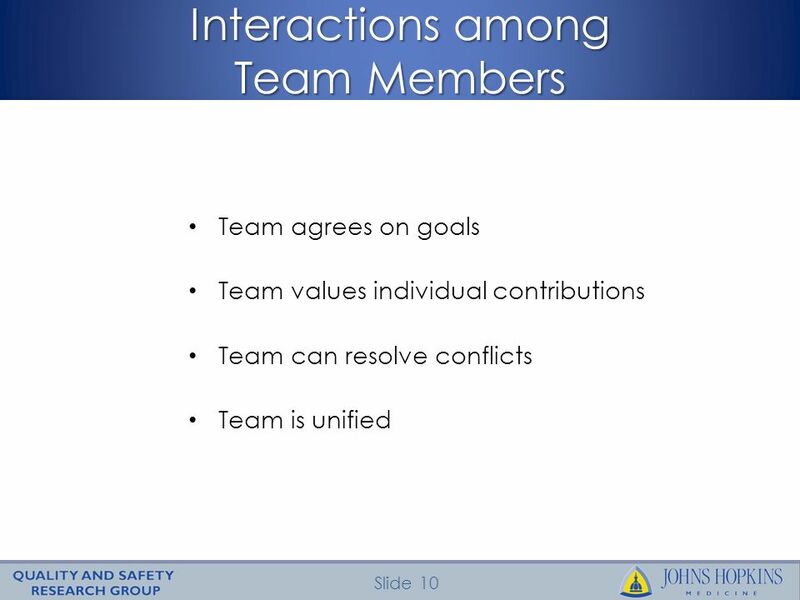 NICU CLABSI Affinity Group Meeting September 12, 2012 Denise Flook, RN, MPH, CIC HAI Collaborative Lead Vice President, Infection Prevention/Staff Engagement. 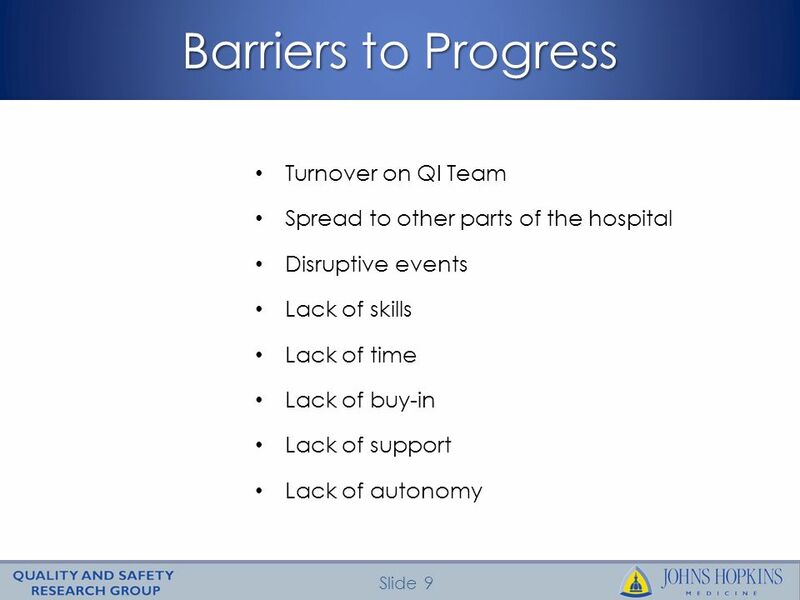 CSTS: The Cardiovascular Surgical Translational Study Senior Leadership of Quality and Safety Initiatives in Health Care Peter J. Pronovost, MD, PhD The. 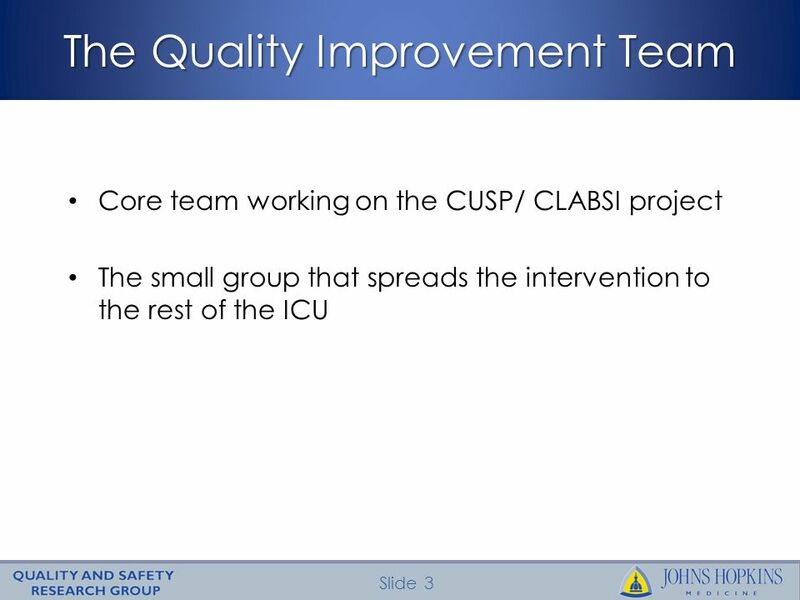 On the CUSP: Stop BSI National Content Call Chris George, RN MS Director, National Projects MHA Keystone Center for Patient Safety & Quality Monthly Team. 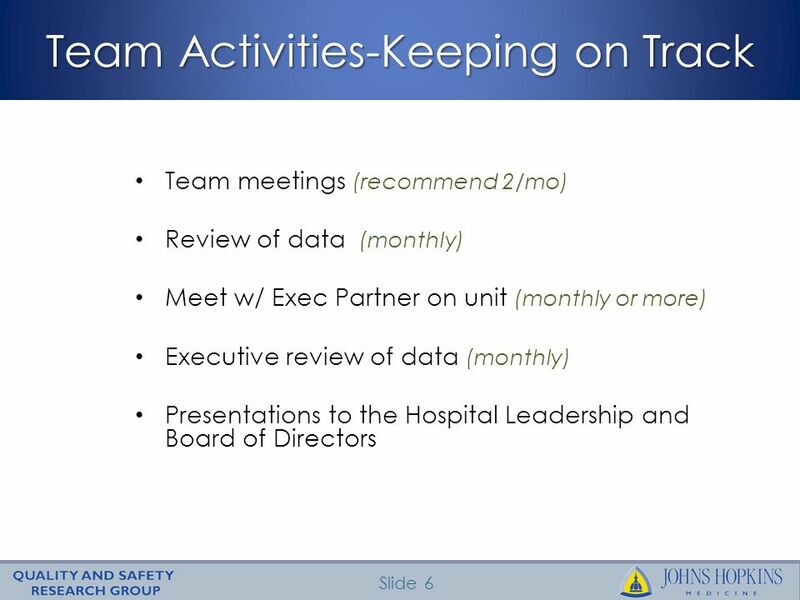 © The Johns Hopkins University and The Johns Hopkins Health System Corporation, 2011 Sustaining and Spreading surgical safety improvements with SUSP Mike. HAI Collaborative Meeting September 12, 2012 Denise Flook, RN, MPH, CIC HAI Collaborative Lead Vice President, Infection Prevention/Staff Engagement.